Here Sassda’s Western Cape Regional Manager Michel Basson gives an analysis of what the 4th Industrial Revolution really means for the South African stainless steel sector. In it he states; “The Fourth Industrial Revolution is not looming, it is already upon us” and asks will South Africa have the skillset to compete…? The South African future landscape has the potential to change dramatically depending on our achieved economic growth with the resultant job and wealth creation and it would seem that the so-called Fourth Industrial Revolution offers the vehicle to this bright future. The true potential of this most recent revolution is the fact that this future is rather undefined and therefore limitless. In a sense, it resembles a fresh opportunity for the South African future should we be prepared to take full advantage. The Fourth Industrial Revolution is not looming, it is already upon us. In order to judge our own readiness, it is important to understand how South Africa used opportunities offered by the three previous revolutions. The First Industrial Revolution took place from the 18th to 19th centuries in Europe and America. It was a period when mostly agrarian, rural societies became industrial and urban. The iron and textile industries, along with the development of the steam engine, played central roles in the Industrial Revolution. In South Africa, the discovery of minerals in the late nineteenth century – diamonds in 1867 and gold in 1886 – dramatically changed the economic and political structure of southern Africa. South Africa had an extremely valuable resource that attracted foreign capital and large-scale immigration. Discoveries of gold and diamonds in South Africa exceeded those in any other part of the world, and more foreign capital had been invested in South Africa than in the rest of Africa combined. The Second Industrial Revolution took place between 1870 and 1914, just before World War I. It was a period of growth for pre-existing industries and expansion of new ones, such as steel, oil and electricity, and used electric power to create mass production. Major technological advances during this period included the telephone, light bulb, phonograph and the internal combustion engine. South Africa’s industrialization has from the outset depended on what some refer to as the Minerals-Energy Complex. From the 1920’s state corporations in electricity, steel and transport combined with private mining conglomerates to build an economy based around the extraction of minerals using cheap forms of energy. To make it all work, apartheid policies ensured the supply of cheap and compliant black labour. None of the underlying assumptions that drove capital accumulation in apartheid South Africa exist anymore. Post 1994, South Africa has been undergoing a process of de-industrialisation – even if the economy as a whole has grown This is important because a recent study by the well-known Harvard bases economist Dani Rodrik entitled “Premature de-industrialization” shows that South Africa joins a club of other developing nations which are de-industrialising before they become rich developed economies. Manufacturing, he argues, drives labour productivity, is able to absorb significant quantities of unskilled labour and as it is a tradable sector, it can expand via exports even if the rest of the economy cannot absorb what is manufactured. In short, other than a few exceptions, manufacturing is an escalator and the main channel through which rapid economic growth has taken place in other developed countries in the past. His data shows that employment in South Africa’s manufacturing sector peaked in 1981. Since then it has been in decline. In the absence of the traditional manufacturing route, economic growth in developing countries are driven by capital inflows, external transfers, or commodity booms which are often not sustainable. As the country moved into the next revolution, some services such as IT are tradable but are typically highly skill-intensive without the capacity to absorb the type of labour that low and middle-income economies have. The Third Industrial Revolution, or the Digital Revolution, refers to the advancement of technology from analog electronic and mechanical devices to the digital technology available today. The era started during the 1980s and is ongoing. Advancements during the Third Industrial Revolution include the personal computer, the internet, and information and communications technology (ICT). Due to its isolation during these important years, South Africa never really made full use of potential growth areas in the global arena. Entrepreneurs such as Mark Shuttleworth, brought the South African mindset closer to the Third Industrial revolution as users and consumers. However, the local industry (still somewhat stuck in the Second Industrial Revolution) never developed into its full potential. There is still no locally developed computer, cellphone or even some form of semi-conductor industry. 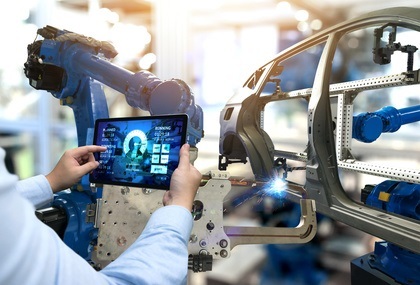 The Fourth Industrial Revolution builds on the Digital Revolution, representing new ways in which technology becomes embedded within societies and even the human body. The Fourth Industrial Revolution is marked by emerging technology breakthroughs in a number of fields, including robotics, artificial intelligence, nanotechnology, quantum computing, biotechnology, The Internet of Things (IoT), 3D printing and autonomous vehicles. The South African banking sector is making good use of this, as well as new breakthrough innovations in specialised fields such as medical applications. However, these advances do not contribute to large scale job creation or skills development. The latest revolution is disrupting almost every industry in every country. And the breadth and depth of these changes herald the transformation of entire systems of production, management, and governance. It also offers limitless opportunities. In the greater scheme of things, the technology advances of the Fourth industrial revolution are still fledgling technologies – we haven’t begun to see the full effects, both positive and negative. Will the Uber phenomenon result in fewer cars being purchased? Will virtual reality cocoon us in our living rooms, seldom to reach out and physically touch another human being? Will the shopping mall be replaced by online purchases, delivered by drones? And this is just the tip of the iceberg – tomorrow’s everyday technology is yet to be invented. There is no reason South Africa and the rest of the continent cannot take advantage of the fourth industrial revolution, climb aboard and ride that wave to a brave new future. In fact, it’s essential for South Africans not to simply be consumers of goods and services provided by the countries that master fourth revolution technologies. It will take a few basic conditions, however. The energy sector offered an opportunity for skills development, but the role of alternative energy and so-called sustainable industry is still being argued, but it is well known that education is a big challenge and key condition in South Africa: these technologies are reliant upon skills and knowledge that is still being developed and the youth and the existing labour force should be prepared for it. This is particularly salient regarding the looming Fourth Industrial Revolution, which signals that over one-third of skills (35%) that are considered important in today’s workforce will have changed in a mere five years from now. Predictions are that by 2020, the Fourth Industrial Revolution will have brought us advanced robotics and autonomous transport, artificial intelligence and machine learning, advanced materials, biotechnology and genomics that will transform the way we live, and the way we work. Some jobs will disappear, others will grow and jobs that don’t even exist today will become commonplace. South Africa’s future workforce will need to align its skillset to keep pace with these developments. It is clear that basic education should be brought to a global standard allowing future generations to be a part of this global change. However, this a ship that will take decades to yield the required results. Unfortunately, there is no time and we have to evaluate what we have and develop it to a level compliant to the requirements of the future industry. The Toolmaking Association of South Africa has developed a skills development programme over the past few years with extremely favorable results. Based on this model, the Intsimbi National Tooling Initiative (NTI) Programme, is a newly launched, South African, multi-stakeholder initiative that was established under the auspices of the Department of Trade and Industry and the Toolmaking Association (TASA) to implement a turnaround strategy for South Africa’s distressed tooling industry. The Initiative is enabling government and industry to cooperate on the large-scale interventions required to rehabilitate the South African Tool, Die and Mouldmaking (TDM) sector for the benefit of the South African manufacturing sector. Why the Intsimbi NTI? 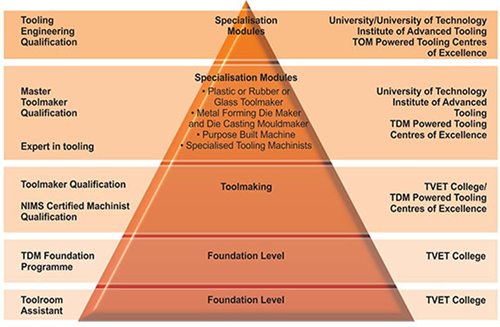 The local TDM industry has over the past 25 years lost considerable (80%) tooling capacity. Local companies currently satisfy less than 15 % of the local and less than one per cent of global TDM demand as they have failed to adopt the technology and production efficiencies of their developed counterparts. Ageing skills capacity in the sector was not replaced timeously which lead to a serious skills shortage in the TDM industry. The performance of the sector remained curtailed by the low demand in South Africa’s main export markets in the developed world. Since its onset the INTSIMBI NTI, however, sought to not only halt the decline of the sector but to embark on a robust rehabilitation programme to put the local TDM industry on a firm trajectory to international competitiveness. The Initiative is driven by two programmes namely the TDM Powered Skills Development Programme and the Enterprise Development Programme. The TDM Powered pilot programme was introduced in 2009 and approximately 1 400 students are currently (2015) enrolled in the programme. The TDM Powered Skills Development Programme is presented at 15 training institutions across South Africa and offers academic, practical workshop and on-the-job training for the Foundation, Apprenticeship, Master Toolmaker and Engineering programmes. The Enterprise Development Programme has to date benchmarked 56 companies in conjunction with the WBA Institute in Germany, a world authority on tooling-related research and consulting. Corrective strategies were put in place and the majority of the companies have already been turned around successfully. The TDM Powered pilot programme started in 2009 and the first 288 students graduated early in 2014 and started contributing to the success of the manufacturing sector. In 2014 more than 1 400 students were enrolled. Of these 200 have graduated in mid-2015 – 72 in the Apprenticeship and 128 in the Foundation Level Programme. A Master Toolmaker Programme, accommodating a 100 students per year, was launched in 2014. The Intsimbi NTI Enterprise Development programme has, in conjunction with the WBA Institute in Germany, successfully conducted benchmarking of 56 local companies and commenced with intervention projects at nine companies nationally as part of the broader NTI rehabilitation strategy. The NTI intervention consulting approach was developed and tailored specifically for the South African TDM sector to strategically rehabilitate and grow the sector according to international best practice trends and standards. After a company has completed the benchmarking process, the next step is to form part of the intervention design as part of the broader consulting approach. The basic principles of this model are rooted in an international model developed to grow regional industries and not focused on the tooling industry only. It is well tested and proofed to be effective. The key to the effectiveness and relevancy is the partnership between government, private sector and educational facilities to deliver world class skills that suits the future.